Just days after making its big debut at the North American International Auto Show, in Detroit, the most powerful production Ford Mustang Shelby GT500 sold at the Barrett-Jackson Auction to raise money for charity. Earlier this week, the all-new 2020 Ford Mustang Shelby GT500 made its world debut promising more than 700 horsepower. The most powerful production Mustang Shelby ever showed off some of that horsepower at the Barrett- Jackson Auction, Friday night, where it sold for $1.1 million. Ford donated all of the proceeds from the first production model 2020 Mustang Shelby GT500, with VIN 001, to help the JDRF. The Juvenile Diabetes Research Foundation is the leading organization raising money to fight Type 1 or Juvenile Diabetes. 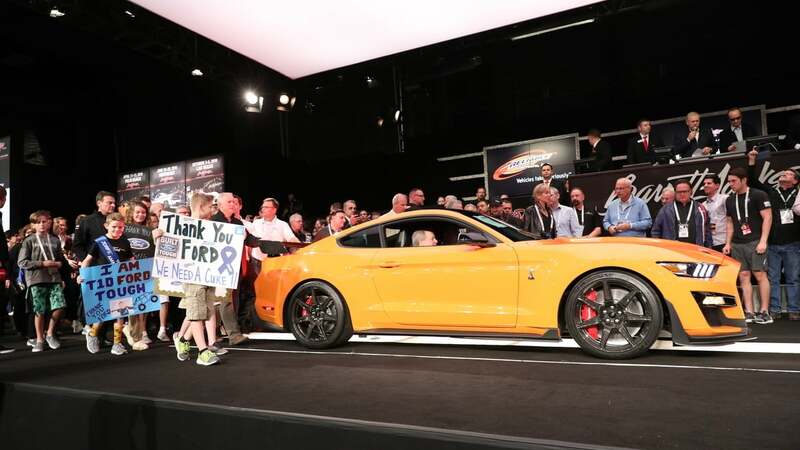 The top bidder was Craig Jackson, chairman and CEO of the Barrett-Jackson Auction. Both Edsel B. Ford II and Aaron Shelby, grandson of the legendary Carroll Shelby, accompanied the all-new Shelby GT500 onto the block, in Scottsdale, Arizona. The vehicle, known as Lot No.3008, sold at “no reserve” meaning that it would go the highest bidder, regardless of price. Craig Jackson won the right to claim the first production model Ford Shelby GT500. Jackson can choose from any of available colors and options for the model. Edsel Ford II and his wife Cynthia have a son, Albert, who was diagnosed with Type 1 diabetes in 1997, when he was four years old. Ford Motor has donated millions to JDRF over the years and has donated several highly-desired vehicles like the 2020 Ford Mustang Shelby GT500 to raise money for the cause. Edsel and Cynthia Ford have also donated millions of their own money to JDRF, as well as serving on the charity’s board over the years. Owning the first production vehicle of what is expected to be an “instant classic” is priceless. The 2020 Mustang Shelby GT500 draws on Carroll Shelby and Ford’s many performance collaborations that began with the Cobra roadster in 1962. Ford and Shelby cooperated on one of the most celebrated race cars in history, the Ford GT-40. The iconic GT-40s won the most important race of its time at Le Mans. The GT-40 has been reincarnated as the Ford GT supercar. In 2006, Ford and Shelby announced a new generation Ford Shelby GT500. The first 2007 model year car available to the public was sold at Barrett-Jackson in Scottsdale with Edsel B. Ford II and Carroll Shelby watching from the block. In 2019, Carroll’s grandson Aaron was there, along with Edsel Ford, to help write a new chapter in the iconic Mustang Shelby GT500’s history. The limited-production car will be available in the United States and Canada this fall. Ford says fuel economy and actual horsepower figures will be available closer to the sale dates.